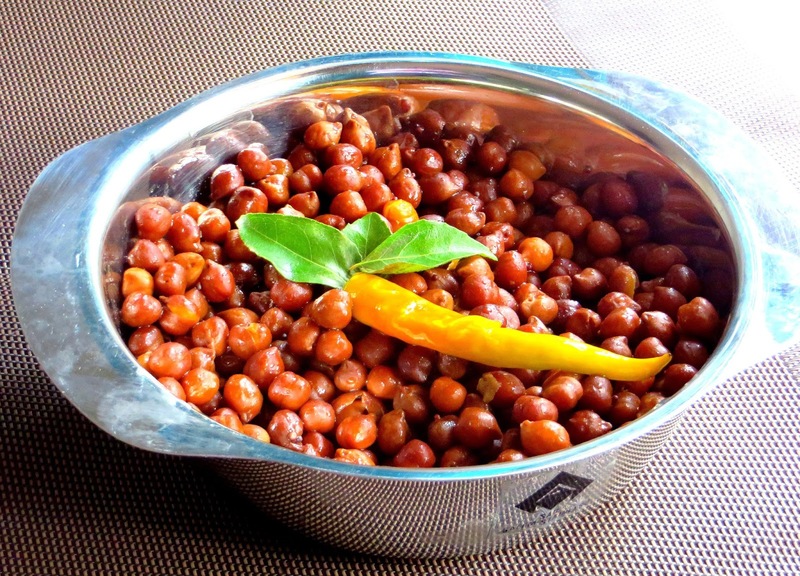 Kala channa or Kondakadalai as it is called in tamil is a type of legume from the chicpeas family. This protein and fiber rich legume is definitely a choice for people who want to smart snack. Its excellent for controlling blood sugar. Kala channa can be used as a part of a healthy diet and it aids for weight loss and weight management. Here is a simple recipe for a sundal using this excellent legume. Soak Kala channa in water over night. Sprouting this channa is a great idea for added benefits. Drain water and Pressure cook the channa with just enough water and 2 teaspoons salt for 6 whistles. Kala channa takes longer time to cook. Hence, boiling method is not preferred. Drain water and keep it aside. Heat oil in a kadai and temper the mustard seeds. Add green chilli and the curry leaves if using them. Add channa and just sprinkle salt as channa is already cooked in salted water. Grated carrot and chopped coriander leaves and finely minced ginger and cucumber can be added to make a tasty salad.